American Legion National Commander Jimmie L. Foster meets with D-Day veterans at a ceremony outside the Airborne Museum in Ste. Mere-Eglise, June 5. 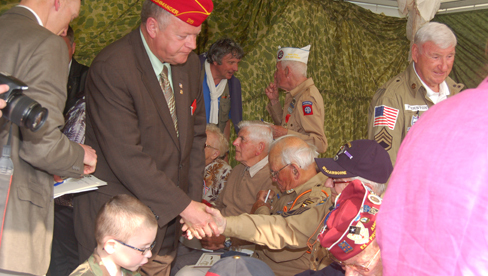 American Legion National Commander Jimmie L. Foster shook hands with some of history’s most revered combat veterans Saturday in Normandy, France. Joined by American Legion Auxiliary National President Carlene Ashworth, Foster sat at the head table of the annual Association Des Amis Des Americains banquet in Ste. Mere-Eglise, the first town liberated in the U.S. Allied invasion of Normandy on June 6, 1944. Foster and Ashworth visited Pegasus Bridge and Arromanches in the British sector of the famous D-Day beach-head Saturday morning before attending a ceremony at the Airborne Museum in Ste. Mere-Eglise where nearly a dozen U.S. D-Day veterans were honored. Among those the commander and president met were Zane Schlemmer of Hawaii, a D-Day paratrooper, Fred Morgan of Georgia, a medic in the invasion, and James Hill of Tennessee, who was wounded on Omaha Beach. The dinner in Ste. Mere-Eglise kicked off a weekend of World War II commemorative events in northwestern France. Attending the dinner were more than 500 active-duty men and women from various duty stations including Air Force and Army Airborne personnel in Normandy to conduct training jumps over the Merderet River Valley, where U.S. paratroopers fought in some of the deadliest battles of World War II. On Saturday, Commander Foster also attended a ceremony in Chef du Pont where the first annual Maureen Kennedy Awards were presented, in the memory of well-known U.S. nutritionist Maureen Kennedy, who often visited Normandy to pay tribute to those who died fighting for freedom. Receiving awards were Operation Democracy of Locust Valley, NY, a non-profit organization which has recently been resurrected to provide relief items for war-torn communities in the Middle East, as it did for Normandy after World War II. 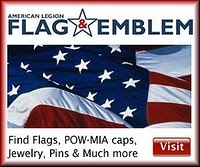 The Amis Veterans Americains, an association in Ste. Mere-Eglise that supports U.S. veteran connections in the town, received the other Maureen Kennedy Award. Each came with a $5,000 honorarium.